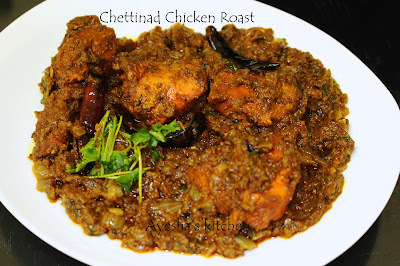 The Chettinad chicken roast is a spicy and flavorful roasted chicken dish from the region of Chettinad. This is the most popular chicken roast with fresh flavors. 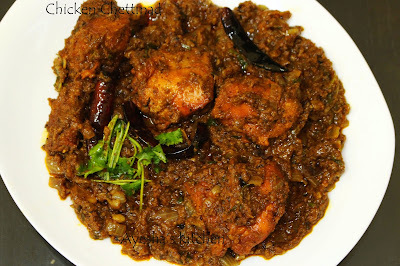 Here am sharing the best recipe for Chicken Chettinad. Nowadays, in most of the restaurant in South India mainly in Kerala, Chettinad dishes play a great role in their menu. They offer us amazing taste but mostly ends up with some digestive problems. Thus I prefer home cooked food which is healthy and tasty too. Dry roast these spices in the wok until aromatic. Then blend it in a blender to a fine powder. Set aside. Marinate the chicken pieces with chili powder and salt. Set aside. Heat a wok with butter and toss the chicken in the butter for two minutes. This makes chicken more soft and flavorful. And marinating chicken with a chili powder is to avoid the whitish color of the chicken. When done, transfer it to bowl. Now heat the wok with some oil. (if there is leftover butter in the wok, skip adding more oil). When hot, add curry leaves, chili and then sliced shallots or onion. Saute until golden and then add ginger garlic paste. Saute for few minutes and then add the tossed chicken to it along with turmeric powder and salt. Mix very well. Let it cook with lid closed for 15 minutes. Do not add water. Now open the lid and let it cook for 5 minutes stirring continuously on high flame. This is to make the gravy thick. When done, add the Chettinad masala powder and mix well. Roast the chicken well until the chicken is well combined with the masala or gravy. (for 10 minutes on a medium flame, stir occasionally). Garnish with fried dried red chili and chopped coriander leaves. NOTE: Always add the spices according to your taste and preference.